Next Year's Trip. Early Map. I have been inspired to post this tonight as I watch the NRL, with Manly giving Souths a flogging - it's 30-2 at half time FFS! And I was thinking of lyrics from songs that included "shocker" and "slaughter" in it. And this one came straight into my head. It comes from the movie of the same name, a B-grade slasher flick that mostly drew us in to go to Sydney to watch it because of the people on the soundtrack. For 19 year old males, this was a classic film in the day. It may not seem that way anymore, as it has dated badly, but for a laugh it's still worth a watch, if only for Mitch Pileggi of The X Files fame who plays the villain. The Dudes of Wrath is an all-star band put together to do this song for the soundtrack, including Paul Stanley, Desmond Child, Vivian Campbell, Rudy Sarzo, Tommy Lee, Kane Roberts and Michael Anthony. The song is cheesy as hell, but damn if it wasn't catchy in the day. And cheesy. Ah, it's all in fun and a bit of a giggle. Meanwhile, Souths has cut the deficit back to 30-8. Good luck chaps. "We will have the power!" I post this song every year on Anzac Day, and it makes sense that it should be a part of this collection because it really is a song of my life. John Williamson has always been there for Australians. His collection of witty songs, humorous songs and thought-provoking songs all have Australia and its folklore as a base point within them. And many of them when you listen to them cause your chest to fill and heart to pump with national pride. The references to Port Lincoln and the movie made here are to do with the film 'Gallipoli', where the beach scenes were filmed for it. The rest is for your own consumption. It is still as poignant today, 102 years after the initial landing on the fatal shores. ANZAC Day today has greater meaning for all Australians, a day that we remember the sacrifices of all men and women who fought in all conflicts. We mourn their loss, and celebrate their bravery. This isn't just a song for today, it is a song for every day. But on Anzac Day, I will always play it. It just feels right. Lest We Forget. You are the Diggers of the Anzac. This really should have been so much better than it turned out, because the idea itself is a good one. To be honest, I think it tries too hard for laughs (which it doesn't succeed in) than to make a good story from a good idea. The first half of the episode is bogged down too much in introducing us to our protagonist, who as it turns out is an antagonist to everyone around him. It sets up his character too long, and essentially too hard. OK, we get the idea that he talks a lot, is a know-it-all in a harmless kind of way. The problem being that once we get to the actual idea of the story - about a stopwatch that can stop time for anyone who holds the watch - two-thirds of the episode has gone! Which leaves almost no time to allow our protagonist to discover what the watch can do, and what he can do with it. Instead of being able to watch him walk through the episode discovering this, all we are left with is an instant realisation, which he begins to put into effect, before the inevitable conclusion comes, and the episode is over. What are we left with? A great story idea, a main character that is overplayed, and a story that leans to heavily in showing us the characters foibles rather than letting us enjoy what could be achieved with such a remarkable watch. This was remade and re-written for the 1985 revivl series, and that episode did it a lot better than this. 1. 5/5. The Dead Zone. I knew nothing of Tenacious D when I first saw their album cover, which was what first drew me in. Then I saw they had a song titled "Dio", and when I first heard it I realised it was indeed about my hero Ronnie James Dio (yes, I know there is a very similar thread in most of my Songs of My Life including Dio...). And so I bought the album, and the rest is history. This was the song released from the album, upgraded from how they performed it on their TV show. Utilising the talents of Dave Grohl on instruments and as the Devil in the film clip, this song went ballistic and made Tenacious D stars in their own right. It's not their only great song, but it is the one most people know. Not only are they humorous, they can both sing, and Kyle Gass is a terrific guitar player. And how do you come up with this idea - a song sung as a Tribute to a song you sang to defeat the Devil, because you can't remember how the actual song went. Brilliant. And when Jack proclaims "we are but men! ", tears open his shirt, and they both rock with the light behind them... how can you not laugh and join in at the same time? We saw the D live at the Sydney Opera House a few years ago in all of their acoustic glory, and they were as fantastic as I ever imagined they would be. And when they played this song, and everyone in the whole house was singing it back at them, literally drowning out their own vocals, it gave me goosebumps and shivers down my spine. Book #8. The Dead Zone. 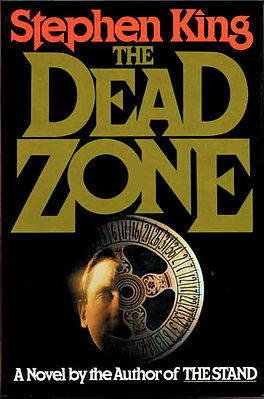 I know I’m going to say this a lot as we go through the reviews of all of Stephen King’s bibliography, but The Dead Zone has been one of my favourite books from the first time I read it. To be honest I read it three or four times in a very short period when I first got it, and then probably once every year for a number of years after that. In recent years I haven’t been able to devote that much time to re-reading old favourites, but having just finished this once again, I can only say that it was a wonderful and magnificent experience. Again. The plight of Johnny Smith, who from an accident at an early age and a subsequent much larger accident in his early twenties that leaves him in a coma for four and a half years seems to develop an psychic ability to be able to see parts of a person’s life – either past or present or future – just from having contact with them directly or with an item that they have touched, is one that seems to have little joy for the individual in question. An unassuming man with a lop sided smile, his whole life is turned upside down while visiting a local carnival, from which the rest of the story expands. It’s a sad story in retrospect. Johnny’s whole life from this point on is a mess, full of pain and agony and stress, as he tries to find his place in the world that has left him almost as a freak of nature. The different parts of the entire story are woven into the fabric of the book all the way through, and on first reading most seem completely out of place, and irrelevant to what is happening at that time. And yes, this is partly true. It isn’t until each part suddenly shows up in the life of Johnny Smith that the lightbulb goes on in your head and you think, “Ohhhh… THAT’S why that was spoken of earlier!”. And as each of those instances turns up, you become more and more impressed at the way the story comes together. What do I mean by that? Well, I’m not specifically speaking of Greg Stillson and his antics, as he is obviously seen as the main event antagonist from the very beginning. The madness and imminent danger of Stillson is apparent from the very start of the novel, with the initial scene of him kicking a dog to death particularly violent and disturbing, and his introduction so early in the piece alerts you to the fact that he is to be a major player. His building of power throughout the story is obviously significant to the end game. But the by play and side stories I am alluding to are such things as the Castle Rock Strangler, with the early telling of those murders not really coming into the main story under Sheriff Bannerman makes contact with Johnny later on in desperation to try and find the killer – and suddenly it is a part of the main storyline. Or the visit of the salesman to the bar in the desert, who really has only come in for a drink but decides to have a crack at selling the establishment the lightning rods he supplies to help protect it. It seems like a random and unusual chapter in the book, until it becomes the venue for Chuck’s graduation party later in the novel, and Johnny sees it burn to the ground, which sets off another of the ‘big picture’ events of the book, and once again you realise how clever the earlier set up was. The novel also utilises the real events in the United States from the first half of the decade of the 1970’s as a backdrop, and especially in the growth of Stillson’s political movement. King also highlights the growing religious fervour of the time by instilling the madness into Johnny’s mother, and her growing need to follow the many different ‘cults’ and religious and UFO movements that graced that period in the country. Throughout the whole story, the question of Johnny Smith’s ability is handled wonderfully well by King. He does not get ‘flashes’ from everything and everyone he touches. He can’t search for information that he or someone else wants to get from touching an object, he can only receive the information the object or person gives off. That’s what makes his ability so fascinating. He is not looking to find information in most instances, the information is forced upon him. It is only really when he decides he wants to meet politicians at rallies for the forthcoming election that he seeks out people with the direct focus on finding out about them. Certainly when he goes to see Greg Stillson, it is with this directive. What he discovers changes what remains of the rest of his life. Through it all, Johnny wants to remain normal. His love for Sarah is a battle as he can never reclaim the four and a half years of his life in which he was in a coma and through which she changed her life considerably. His dream is to teach again, but at every turn he is surrounded by the hysteria when he once again has one of his flashes which changes the course of his life. The struggle and comparison throughout the novel of whether or not God has given him this gift for a reason, as his mother fervently believed, or if he has been cursed for the loss of those years in a coma, then the rehabilitation, and then being unable to lead a normal life because of the constant publicity surrounding him, is easily transferred onto the pages, and allows the reader to believe what they wish without King writing a right or wrong essay on the subject. Even at the end, with the final deed carried out, King allows both sides of the argument to air their thoughts when it is discovered that Johnny had a brain tumour, and while some would believe he tried to kill Stillson because the tumour was corrupting his brain and thoughts, others would believe he truly had the gift of foresight and it was only because his time was running out that he had to act. Again, King leaves it open for the reader to decide. The one big marker being that Johnny did have this ability, and as such would he have killed Stillson if he didn’t think people were in danger? The book is so well crafted, and so well written, that it is impossible to put it down while reading. It is just over 400 pages long, but once again I had finished it before I knew it. Just three days on this occasion. Each part is fascinating. The accident at the lake in Johnny’s youth. The evening at the carnival with the Wheel of Fortune. The years of coma. Johnny’s awakening and those early flashes. The night at Castle Rock. The teaching of Chuck. The travelling to the political rallies. The lightning strike at the high school graduation party. All with Stillson’s growing demeanour throughout, and leading to the final conclusion to the book. This is truly one of his masterpieces, and without doubt one of his best ten. Most likely (which I won’t know until the end of this process) one of his top five. Book #7. The Long Walk. First published July, 1979 as Richard Bachman. The Long Walk has been one of my favourite Stephen King releases ever since I first discovered it in the collection The Bachman Books. Without trying to get all meaningful and geeky, it spoke to me from the start. Firstly in trying to imagine a dystopian future where this kind of event could be allowed to take place, secondly in trying to imagine why anyone would allow themselves to be suckered into entering an event like this, and thirdly in the way the participants bind together initially in their own groups but eventually as one even as they try to outlast everyone to the end. Like most great books, I find they tend to get better the more I read them. Finding some detail that has passed you by in previous readings, or remembering some detail that you had completely forgotten, are the best bits of re-reading favourite novels. 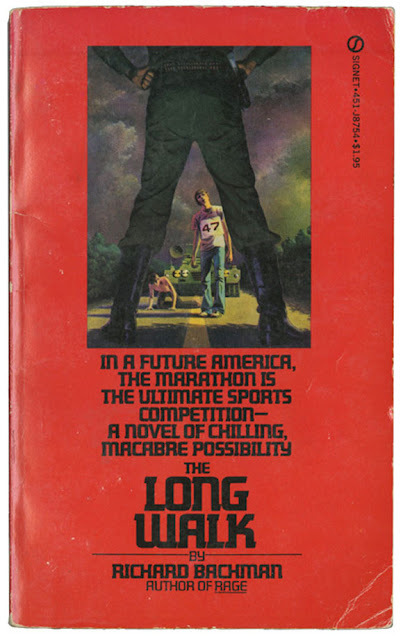 The Long Walk, unlike its name, is only a medium sized read when it comes to Stephen King as well, and even so I have trouble putting down once I have picked it up to start again. Once again it is the characters, and King’s wonderful ability to flesh them out beyond the simple and mundane, that makes this story so engaging. According to King, along with much of his Bachman material, this was written well before his first published works. And like Rage, this utilises the angst of teenager-dom excellently, and transfers it to the pages of his story so well. It is also not perfectly clear exactly what we have here until we are past the introductory stages. That we have 100 teenage boys who have been selected from a lottery for a walk comes across, but until the first ‘contestant’ is removed from the Long Walk, the consequences of the event are not perfectly clear. Once you realise that this is a race with no defined finish line, except that it finishes when only one boy remains, the whole dynamic of the story takes a different track completely, and you begin to feel the joy, the pain, the agony and the dog-gone tiredness of the competitors as you read. Even in a Long Walk, King manages to weave the bizarre and the incomprehensible into his story. Scramm, who is married with his first child on its way. Mike and Joe, the Hopi Indian brothers (“It’s an abortion, that’s what it is!”). Harkness, who is going to write a book from a Long Walkers perspective when (if) he wins. Olsen, who starts out full of bravado and soon finds out the true meaning of what lies ahead. And Barkovitch, who proclaims he will walk on everyone’s grave, and becomes the pariah and villain all in one. The main character triangle of Garraty, McVries and Stebbins is where the heart of the book lies. Garraty’s naivety and general openness cut against McVries constant travelling between gaiety and cheerfulness into dark and deepening thoughtfulness. One moment he taunts Garraty about his naivety of a situation, and not long after he taunts him angrily of his stupidity. More than any other character, McVries is the one who centres the different aspects of the Long Walk. In between his own light conversation with the Walkers, he vows to walk Barkovitch down because of his attitude, and he twice risks his own elimination to get Garrity back up and moving with him. But this doesn’t stop him from moodily disregarding Garraty at various intervals along the way, all to Garraty’s own bewilderment. Their friendship, if that is what you can call it, is what makes the meander along the roads of Maine most engrossing. King also uses Stebbins perfectly. He is the announcer for the Long Walk, the interval where we discover more about what is happening. It isn’t until the final phase of the story that Stebbins steps up and makes his play, at which time the true horror of the event is coming to its conclusion. Even at the end, King has left us in some sort of limbo. It is ambiguously left open to the reader to imagine what happens once the concluding pages have been read. Perhaps the finality of it all is completely straight forward. Certainly Garraty appears to see what we would expect him to see. The dark figure ahead, beckoning. Does his Walk go on, and does it stretch for eternity? It appears the most likely scenario, but those who like happy endings could no doubt find a way to imagine that Garraty and Jan indeed end up together, and along with ray’s mother live happily ever after. But that really doesn’t happen a lot in Stephen King novels. In some down time from Deep Purple, bassist Roger Glover took a shot at writing a story set to music which was going to be animated. The album was released with lots of contemporaries being a part of it, but the animated show never came to pass. Except for this film clip. Ronnie James Dio was a relative unknown at this stage, still fronting his band called Elf and before becoming a part of Rainbow. And the man can sing (though I am unashamedly biased about anything to do with RJD). All my kids grew up watching and listening to this song, and though they may deny it now, at the time they loved it. It a world where there is so much evil and killing going on, sometimes you need to reflect on the message of this song, and realise that there is a better way to do this. I still love this song. 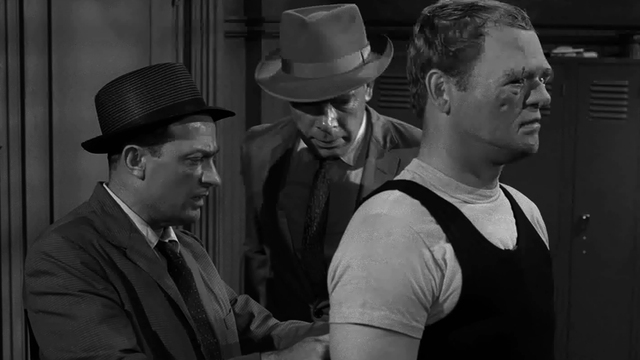 This would be one of the best known and most parodied episode of The Twilight Zone, not only for the episode itself but for the dialogue by guest star William Shatner in the main role of the show. It has transcended the generations. The amusing part is that it all seems a little convenient. Robert Wilson has spent six months in an institution recovering from a breakdown that came on an aircraft in a storm. And guess what? On his way home with his wife, he’s going on an aircraft, and yep it’s smack bang in the middle of a storm! Amazing! 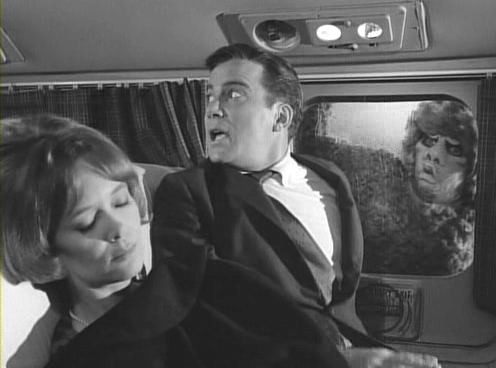 And what is even more amazing is that Wilson happens to see a thing on the wing (“…some…THING… on the wing!) of the plane while they are flying, and not only does it appear to be tinkering with the engine, he is the only person who can see it! Because every single time he calls someone over to have a look, this gremlin seems to know, and flies off out of sight! Remarkable! It might appear convenient, but that is the tie in of the story. Wilson understands that people will think he is crazy and that it is a recycling of his previous condition, but he is also adamant that he is right. His desperation to save the day, by opening the escape door and firing a gun at the gremlin, leaves everyone in no doubt of his mental state, but as Serling himself adds at the conclusion of the episode, the physical damage to the plane, once discovered, will confuse everyone even more. Finally! The trailer we've been waiting for. And it is as ambiguous as we expected. Man vs Robot. The theme has cropped up a number of times through science fiction stories over the years, but this tale by Richard Matheson took it a step further in that the conflict was one where one of the sides had a significant advantage. The idea of the story had merit throughout. Having the fact that boxing as a sport had been banned in the near future due to its brutality – or at least, the combat of man vs man was banned. In its place, robots had been introduced to fight against each other, and now instead of manager and trainer each robot had an owner and a mechanic. Of course, if you can’t afford a newer model robot, and yours seems to keep breaking down and replacement parts are too expensive, then what are you going to do? Such is the conundrum when former boxer Steel Kelly decides he cannot afford to forego the $500 money on offer, and decides to step into the ring himself disguised as his robot boxer and take on the metal monster opposite him. Lee Marvin and Joe Mantell give good performances here that make the episode more watchable than it may have been without them, and their sympathetic portrayals are the best part of the story. Good Friday as a kid tended for me to be the day where not a lot happened, except that you could always watch 'King of Kings' on TV every year without exception, and have religious programming on most of the other channels. And in the true spirit of Easter, there is only one song that I could possibly post here to honour the occasion. From the most honestly religious movie of all time comes the song that since its inception has become the centrepiece of funerals and memorials everywhere. The only song that tells it as it is, that strips away all of the malarky and helps you to realise that we are here for such a short period of time that you have to make the most of it, and that when your time does come, to face it with a smile. So as you come from church today, whatever hymns you may have sung in the bleachers, don't forget to purse your lips and whistle in the car on the way home. (I'll just sit here on the Deck instead of going to church and do the same thing, shall I?). 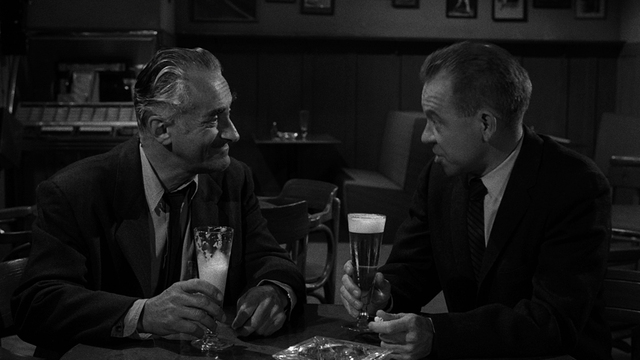 Far be it for me to talk down an episode of any show that draws on memories and melancholy to propel its case, and for the most part this is an enjoyable episode with Rod Serling’s fingerprints all over it. The set out of the episode is fairly predictable as it moves along, but I especially like the way Jack Klugman plays his role. You can see his character is worn out, but his lop sided smile through the early tribulations of the episode gives him an air of serenity. Of course he then breaks that mould once he gets the phone call that his son is dying in a hospital in Vietnam, and having disposed of his employers despite taking a gunshot for his troubles, he stumbles down the road to the fairground that he had been reminiscing over taking his son to. The reuniting with his young-again son follows the course you would expect, and a dying man’s wish then appears to be answered as only the Twilight Zone can. Perhaps this is a bit too much of a religious tome than a Twilight Zone episode. 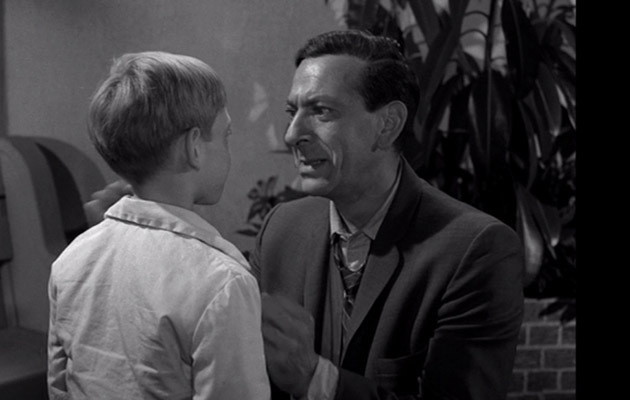 Klugman is wonderful in his role, but it doesn’t quite make up for the feeling that you are being duped. It would have been so easy to put up "We're Not Gonna Take It" as my song here, because it is extremely well known, is a terrific song in its own right, and the video is superb. And this along with other Twisted Sister songs will crop up down the track if I continue this for some time. But it is the title track to the wonderful 'Stay Hungry' album that is the song that has been my favourite. It is one of those excellent 'build-up' songs that I used to listen to before big cricket matches or before batting in such times, to go out with the best attitude and completely focused. This version has the lyrics for you to read along with. They might seem cheesy in this context, but they always worked a treat for me. This always got the adrenaline pumping. It needs to be played loud with the bass turned up, and sung at the top of your vocal range. Awesome. In what must rank as one of the finest Masters finishes ever, Sergio Garcia finally broke through for his elusive first Major championship victory in a final round that had almost everything. Garcia was paired with Justin Rose in the final group, and together they led throughout the whole final round, leaving their opponents to fight for the minor placings. Even a hole-in-one at the 16th by Matt Kuchar to get him to -5 barely caused a ripple on the group at the rear as they fought each other back and forth for the entire final day. Starting the day together at -6, Sergio got away early to -8 and it looked as though he was away. But Justin hung in, and as Sergio faltered he stuck solid, On the 14th Tee, Justin lead by two strokes after a disappointing par at 13, while Sergio had somehow scrambled for his par. Sergio then birdied 14 to move within one, and hit the stick to almost hole out for an albatross at 15. His eagle and Justin's birdie meant they were square going to 16, when Rose again birdied to go one ahead. The tide turned again at 17 where Rose bogeyed, and with two birdie putts missed at 18 it was off to a play-off. The tension just never dropped. Justin was caught in the pine needles with his drive, and then fluffed his second before finding the green with his third. Sergio went up the right side before nailing his second to the middle of the green. Justine missed his par putt, which left Sergio two putts for his first major. No man currently on the PGA Tour more deserved to win a major tournament than Sergio Garcia. There is no one in the world who would want to take it away from him. His victory probably leaves Lee Westwood as the 'most deserving' current player still yet to hold a major trophy aloft. The camaraderie between Sergio and Justin today was just magnificent. Rose again fought hard to become a multiple major winner, and you would suspect that his second won't be far away. Another brilliant Masters tournament comes to an end. As the catchphrase goes on Fox Sports these days, "How good is golf!" When I was in my early teenage years, my father sat me down in the lounge room, put on a cassette, and said "Sit here and listen to this". It was a tape with the character of Fred Dagg, whose droll observations and wit were not only funny but clever. I eventually discovered that Fred Dagg was in fact a man by the name of John Clarke, who continued through the years to come to prominence at just the right moments. No one who watched the brilliant The Games in the lead up to the Sydney 2000 Olympics will ever forget those magnificently scripted episodes, and the way the three leads in particular of Bryan Dawe, Gine Riley and John Clarke just nailed everything in regards to the pits and falls of event. Even more brilliant was the weekly three-to-five minute expose of Clarke and Dawe on ABC on Thursday evenings. Never has political satire been so sharp, so cutting or so accurate. The brilliance of not trying to do a character copy of their interviewee every week, but simply allow John Clarke to be himself playing that person, never ever got tired, and never failed to accurately portray their subject for the week. He was active in so many other projects on stage, screen and radio it is impossible to list them. His starring role in Mick Molloy's "Crackerjack" is one instance where he stole the screen every time he appeared on it. Suffice to say that Australia has lost a legend of the comedy world. Vale John Clarke. Our world is a better place for having had you shine a mirror on it for so many years, and is a lesser place today for your passing. Of the number of songs that epitomised the summer of 1987/88 for me, Whitesnake’s ‘Bad Boys’ is perhaps the strongest. It came from the “1987” album that had been released that year, and it was one of the albums I had on constant rotation throughout that time along with Dio’s “Dream Evil” and Def Leppard’s “Hysteria”. For me, it was the Summer of Bill, having completed the end of Year 12 and the HSC, with three months of nothing but cricket, music and going out with friends. And a lot of what ‘Bad Boys’ is about was so relatable to me at the time that it became somewhat of an anthem. So yes, this was a REAL song of my life, as it still reminds me of those heady days. On New Year’s Eve 1987 we congregated at a friend’s house that was our central location for the night between pub and club visits, and it was ‘Bad Boys’ that not only dominated the stereo there, but on the trips between venues. There must have been down sides in those few months, but I only remember great times, and this song always makes me smile because of them. I’m often asked when did I start listening to heavier music, or at least when did I begin to become interested in it. I can probably trace it back to this song, which received a fair amount of airplay both on radio and TV when it was released. I remember the colours, the hair, the band members looking as though they were having a great time, and the loud music being something that wasn’t always heard in the usual circles. It was… illuminating. The song is a cover version of the original Slade track from 1973, and it did well for both bands. There’s no doubt that the music video for this song did a lot in dragging in new disciples like my 13 year old self to the band and the hard rock genre as well. I didn’t naturally mature overnight into a hard rock fan, but the seed had been sown by this song, and for that reason I can always still jump around singing this at the top of my lungs whenever it comes on. Songs of My Life #56 – Van Halen – Panama – 1984. The big hit from Van Halen’s 1984 album was the single release ‘Jump’, which apart from the increase in the use of synth and keyboards was a popular crossover between the pop and harder rock fans that proliferated my year in high school. And while I did love and still love that particular song, it was always ‘Panama’ that grabbed me more once I got my hands on the album. Why? Well, listen to the way the song is structured and played and you’ll get a better idea. The start of the song kicks you in the chest immediately, it has that energetic start that pulls you straight in without reservations. The thumping rhythm of Alex’s kit and Michael’s bass combined with the brilliance of Ed’s guitar are there from the start, allowing no respite. DLR’s vocals chime in and power away as well, and the simple bridge and chorus are made for singing along to. Even the laid back section in the middle of the song is just perfect Van Halen. While I had heard little bits of Van Halen before this, it was “1984” that made me a fan, and both ‘Jump’ and ‘Panama’ were huge pieces of that. The devastation I felt when they announced Dave was leaving the band is still as real today as it was back then. From the first time I ever read this book, I just loved it. It was the perfect mix of a dark totalitarian future, finding a way to distract people from the harsh reality they face, and coming-of-age fantasicsm mixed with the inevitable horror of the rules of the event that the main characters have signed up for. What’s not to like? The slow build into the reality of The Long Walk works perfectly, and one you are in to the story, it is compelling. I pretty much read it all in one sitting the first time I had it, as I was unable to put it down until I reached the conclusion. I had to know what happened to everyone involved, and to try and understand their motivation – not in the race of course, that becomes obvious, but what their motivation for joining up in the first place was. I’m looking forward to reacquainting myself with everyone here in the race, and seeing if I can discover any new information this time around. Songs of My Life #55 – Faith No More – Zombie Eaters – 1989. By the time that the world had gone crazy with a song called ‘Epic’ and it had been played to death over the radio and the music video TV programmes, our little group of music aficionados had already had Faith No More’s “The Real Thing” album for some time and had dissected it thoroughly. In fact, the band I was in during these days had had a crack at covering songs off the album like ‘Epic’ (averagely), ‘From Out of Nowhere’ (awfully) and ‘Surprise! You’re Dead!’ (successfully). The song that always struck me as the perfect example of their work on this album was ‘Zombie Eaters’, which covered just how brilliant each aspect of the band was. The slow, serene acoustic opening to the song, with Mike Patton’s beautiful soaring vocals chiming in, would always lull unsuspecting people in to a false sense of security, before the crashing in of Mike Bordin’s drums, Roddy Bottom’s guttural bass and Jim Martin’s amazing guitar riff halfway through the song just lightens up the dark side in a mayhemic collision of the two halves of the band. I have a lot of favourite songs from the band, but this one to me was the perfect example of what Faith No More was at this stage of their development. It's almost a year ago that Josh and I went to see Maiden on their Australian tour. This pro-shot from Wacken is the same set list and same quality. Awesome stuff. The Albion Park Junior Soccer Club Under 10 Whites started the new season with their match against Shellharbour White at Myimbar Oval this morning. With only one training session possible due to the rain, the team was a bit rusty, but after a rocky start managed to put their best boots forward. The first half was dominated by the Park opponents, who could have been a number of goals up, if not for the excellent goalkeeping of Jack Tate and good defensive plays from Brock Young and Josh Peters. Indeed, it should have been 1-1 when Noah Black got a ball through the goalie which certainly hit the top net, only to be denied by the referee. A goal at the other end a minute later meant the score was instead 2-0 instead, and signalled a change in the fortunes of the match. Another two quick goals were matched by a great move between Ky Van Helden and Noah which Noah finished off for the first (official) goal of the year for the team. Half time it was 1-4. The second half was highlighted by a tremendous effort from the whole AP White team, who fought tenaciously against their well drilled opponents. New team recruits Belle and Claire Kadwell were both fantastic, running hard and giving their opponents not a moments respite. Zoe Middleton was dreadfully unlucky not to add a goal to the total when she just missed an attacking play in the goalmouth. Indy Middleton worked hard through the centre of the field in both attack and defence. Super Sub Zahli Middleton came on and added pace and enthusiasm in the second half, surprising their opponents with her guile. Jack Tate and Brock Young were again excellent in defence while second half goalie Josh Peters did his job well. Shellharbour could only manage to score one goal in the second half through this excellent effort from the green and gold wall, and though the final score favoured them 1-5 it was a most enjoyable game to watch, and the kids were all fantastic. Coaches Shane Black and Matt Middleton look to have a good fun team on their hands this season, and we are all looking forward to next week already. Also thanks to Andy Middleton for his refereeing in the second half and general encouragement of both teams. Josh about to save a shot at goal in the second half of the match. Three years in a row. And perhaps the run of the year. Just brilliant.